Winter is coming, and with it, the beautiful sport of skiing. If you’re planning your first ski trip this year, you may feel a bit nervous and a tad excited at the thought of cruising down the slopes this December. Before you head off to your ski destination, however, it’s always wise to plan ahead the best you can to ensure you are fully prepared for your trip. Skiing can take a toll on your body if you’re not careful, which is why we recommend a little conditioning before your trip. Even if you don’t plan on skiing down anything other than the bunny hill, your legs are in for a tremendous workout. You may want to consider starting a small workout regimine a few weeks before your trip to strengthen your quads, hamstrings, and glutes. Your arms will have to do some work as well, as you maneuver back and forth on the ski hill using ski poles, so consider adding in some arm exercises to strengthen your biceps, triceps, and forearms. Skiing requires the use of hundreds of body muscles, which you won’t realize until you’re sore the next day! Since this is your very first ski trip, there’s a good chance you haven’t invested in skis, poles, helmets, and goggles. That is totally okay! 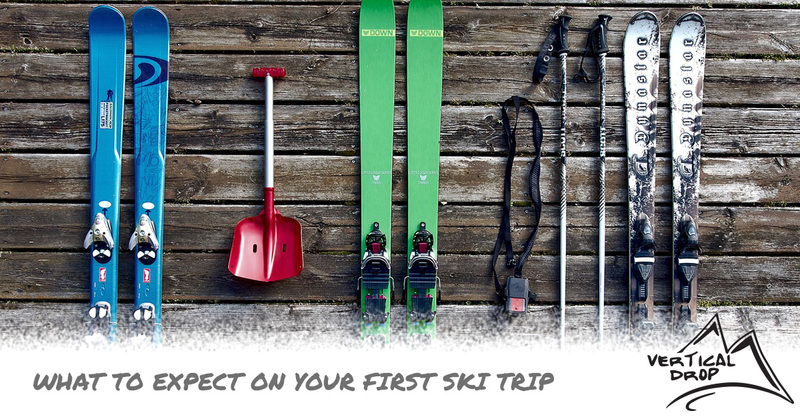 You can rent these items from a ski resort or local ski shop for an affordable price. Before you hit the slopes, make sure you’re skis (or snowboard) has been tuned, but what does this mean? The tuning of a pair of skis involves the skis being professionally waxed, making it easier to glide through the snow. It also includes adjusting the bindings of your skis to your weight, which can help to prevent injuries when you hit the slopes. If you do end up buying your own ski boots and skis, do your best to break them in before you head to the ski resort. Wear your ski boots around the house to break them in a few days before your trip so they are not stiff and restricting. While you may be tempted to grab a sweater and windbreaker before your ski trip, we recommend doing a little research on the proper ski attire. Being prepared for the weather and climate can ultimately make or break your first skiing experience, and it’s always better to be over prepared than underprepared. To start, think about the outer layer of your ski outfit. You’ll want to wear clothes that are water repellent and sturdy so you don’t start shivering mid-slope. You also want to think about the breathability of your clothes. Winter apparel manufacturers offer an array of jackets and snow pants that are lightweight, water resistant, and breathable, it’s just a matter of finding the right fit for you. Next, consider your base layer of apparel. This is the layer closest to your skin that should provide insulation and regulate your body temperature by wicking away sweat and moisture. One thing to remember with your base layer is to avoid clothes made of cotton, because when it gets wet, it stays wet. Look for synthetic materials, like polyester, or thick materials, like wool. Most workout shirts work extremely well for this layer. Unless you’re from a place, like Colorado, you may feel the effects of altitude sickness during your ski trip. Symptoms of altitude sickness include headaches and fatigue. Make sure you drink plenty of water before, during, and after your ski adventures, and do your best to limit alcohol intake. For some extra electrolytes, drink some coconut water before your trip. While skiing may look easy, it takes a bit of time to fully master. Since this will be your first time skiing, we highly recommend signing up for ski lessons at the ski resort you go to. Many resorts offer fun, beginner group lessons where you can learn the basics of skiing and meet new people. You’ll have a designated instructor to show you the ropes and answer any questions you may have. This is a greatway to dip your toes in the wonderful world of skiing. For the best ski equipment, stop by Vertical Drop in Loveland or Zanesfield, Ohio, today.